Found myself in a discussion yesterday about homogeneous anthropological districts, in particular the USA Black Belt. Just thought I’d take a look at the present political representation. 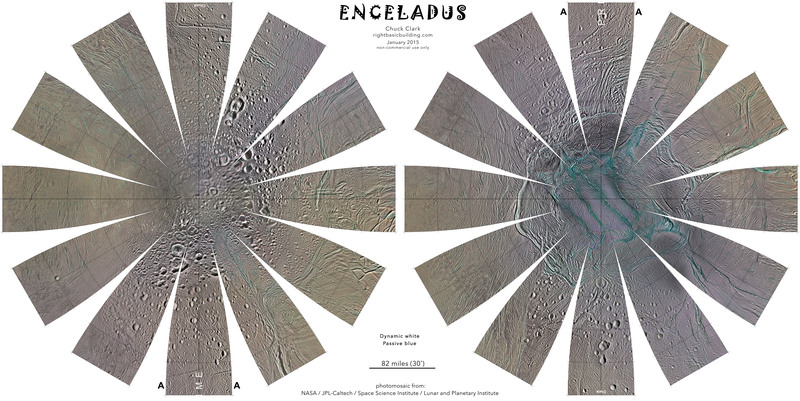 This map corrects map-boundary imperfections in the earlier Enceladus maps. Note the smoother curve at the both pole (left and right tips of the map), and the tangent-to-the-vertical cusp. Suggestions welcome for how to fix this posting glitch. EDIT: the download problem appears to be native to my home computer. Enjoy the map! I had to make up the projection. Long story. Summary is that the cut (the edge of the map) is 270˚ (three-fourths of a circle). 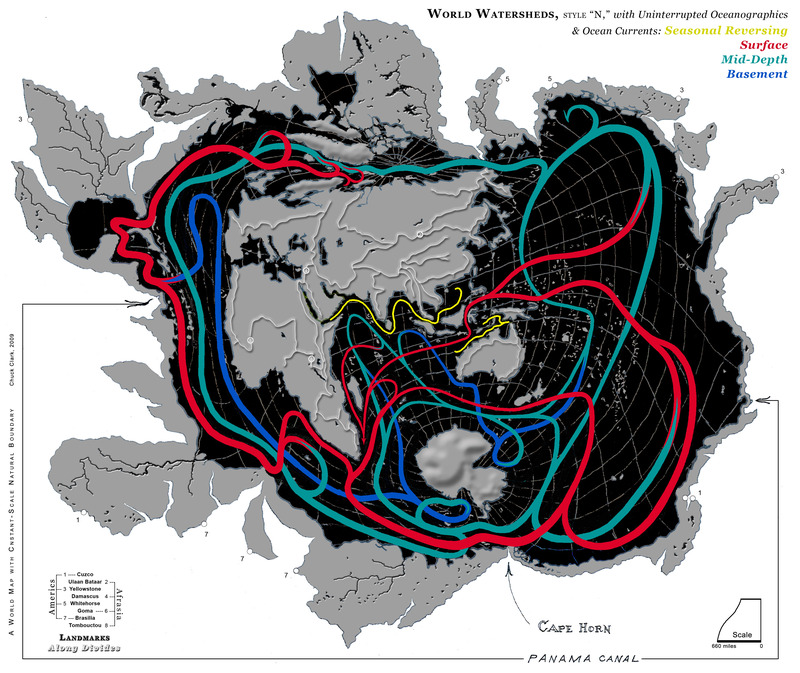 The purpose was to put the tiger stripes, the south polar district, into global context. Other compact maps were either unable to make the polar region large enough, relative to the nether regions, or the map periphery went squirrelly. The cut can turn on 45˚ increments, which has the effect of rotating the stripes around the pole; the lobes refocus from leading and trailing hemispheres (the posted map) to anti- and sub-Saturnian hemispheres. A really large version is in the works. Maybe by March, knock on wood. with a little Photoshopping, you could make your own! Hmm . . . would this projection be of any use on another planet or moon? For instance, here’s the projection applied to Earth (not that you need to know where is San Luis, Argentina!). Not so useful because of the longer interruption. 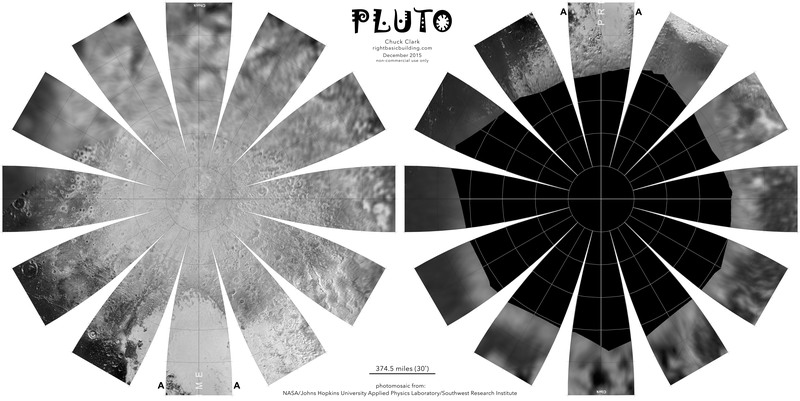 Here’s a daisy-petal foldable map of Pluto . . .
. . . in case anyone has been wanting one. The mosaic is based on the July release, so I expect NASA will have something better for us soon. My design for an children’s participatory exhibit titled Spaces & Illusions, which was installed from 1976–1980, give or take a few months, at Atlanta’s High Museum of Art. Its appearance here in a blog about a novel way to make world maps may appear incongruous until I offer that the process of designing and installing the exhibit presaged all the constant-scale natural boundary maps you find here. Presaged in a cluelessly groping way, I admit, but some things take time to resolve themselves. This image copyright Chuck Clark 2012, all rights reserved. Oh, by the way . . . Under the Pages menu (on the right), a new cut’n’fold map of the asteroid Itokawa sneaks onto the blog. Also (March edit), the beginnings of a cartographic exploration of Enceladus geology. And (April edits) a poster recently presented at the Association of American Geographers annual meeting, as well as the start of a meteorological animation. Further (Feb 2011 edit) a Ganymede foldable geology globe. July 2012: Yo Brazil! Welcome to the site, grateful for the attention. Call me — we’ll do a special map for your 2016 Olympics. January 2013: A new page! — Water Molecule. Scroll the menu on the right.